Thomas Edison, American inventor and businessman, known as "The Wizard of Menlo Park", pushed for the development of a DC power network. 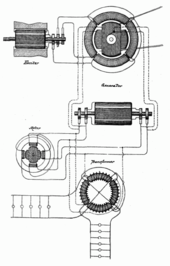 In the War of Currents era (sometimes, War of the Currents or Battle of Currents) in the late 1880s, George Westinghouse and Thomas Edison became adversaries due to Edison's promotion of direct current (DC) for electric powerdistribution against alternating current (AC) advocated by several European companies and Westinghouse Electric based in Pittsburgh, Pennsylvania, which had acquired many of the patents by Nikola Tesla. The direct-current system generated and distributed electrical power at the samevoltage as used by the customer's lamps and motors. This required the use of large, costly distribution wires and forced generating plants to be at a close distance to the loads. With the development of a practical transformer, alternating-current power could be sent long distances over relatively small wires at a convenient high voltage, then reduced in voltage to be used by a customer. Alternating current generating stations could be larger, cheaper to operate, and the distribution wires were less expensive. As the competing systems were protected by patents, there was commercial rivalry between the Westinghouse and Edison companies. A publicity campaign by Edison highlighted the safety issues of high voltage transmission. The lower cost of AC power distribution prevailed, though DC systems persisted in some urban areas throughout the 20th century. The last DC power transmission system in the United States was decommissioned in 2007. While DC power is not used generally for the transmission of energy from power plants into homes as Edison and others intended, DC power is still common when distances are small and is used in essentially all modern electronic devices, such as computers, telephones, and automotive systems. The Hungarian "ZBD" Team (Károly Zipernowsky, Ottó Bláthy, Miksa Déri). They were the inventors of the first high-efficiency closed core shunt connection transformer. The three also invented the modern power distribution system: Instead of former series connection they connect transformers that supply the appliances in parallel to the main line. During the initial years of electricity distribution, Edison's direct current was the standard for the United States, and Edison did not want to lose the associated patent royalties. Direct current worked well with incandescent lamps, which were the principal load of the day, and with motors. Direct-current systems could be directly used with storage batteries, providing valuable load-leveling and backup power during interruptions of generator operation. Direct-current generators could be easily operated in parallel, allowing economical operation by using smaller machines during periods of light load and improving reliability. 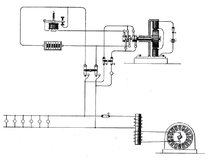 At the introduction of Edison's system, no practical AC motor was available. Edison had invented a meter to allow customers to be billed for energy proportional to consumption, but this meter worked only with direct current. As of 1882 these were all significant technical advantages of direct current. Several companies founded by Edison's investors were consolidated with the incorporation of the General Electric Company in 1889. 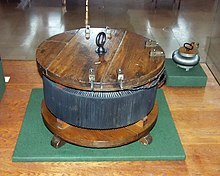 Alternating current had first developed in Europe due to the work of Guillaume Duchenne (1850s), Ganz Works (1870s), Sebastian Ziani de Ferranti (1880s),Lucien Gaulard, and Galileo Ferraris. A prototype of the high efficiency, closed core shunt connection transformer was made by the Hungarian "Z.B.D." team (composed of Károly Zipernowsky, Ottó Bláthy and Miksa Déri) at Ganz Works in 1884. The new Z.B.D. transformers were 3.4 times more efficient than the open core bipolar devices of Gaulard and Gibbs. Transformers in use today are designed based on principles discovered by the three engineers. Their patents included another major related innovation: the use of parallel connected (as opposed to series connected) power distribution.Ottó Bláthy also invented the first AC electricity meter. The reliability of the AC technology received impetus after the Ganz Works electrified the large European metropolis of Rome in 1886. 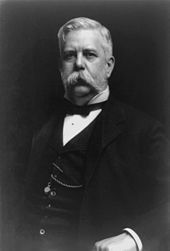 George Westinghouse, American entrepreneur and engineer, financially backed the development of a practical AC power network. In North America one of the believers in the new technology was George Westinghouse. Westinghouse was willing to invest in the technology and hired William Stanley, Jr. to work on an AC distribution system using step up and step down transformers of a new design in 1886. After Stanley left Westinghouse, Oliver Shallenberger took control of the AC project. In July 1888, George Westinghouse licensedNikola Tesla's US patents for a polyphase AC induction motor and transformer designs and hired Tesla for one year to be a consultant at the Westinghouse Electric & Manufacturing Company's Pittsburgh labs. Westinghouse purchased a US patent option on induction motors from Galileo Ferraris in an attempt to own a patent that would supersede Tesla's. But with Tesla's backers getting offers from another capitalist to license Tesla's US patents, Westinghouse concluded that he had to pay the rather substantial amount of money being asked to secure the Tesla licence. Westinghouse also acquired other patents for ACtransformers from Lucien Gaulard and John Dixon Gibbs. Nikola Tesla, inventor, physicist, and electro-mechanical engineer, who held several instrumental patents in the Westinghouse AC system. The "War of Currents" involved American and European companies whose heavy investments in one current type or the other led them to hope "their" current type would be favored. Edison's DC distribution system consisted of generating plants feeding heavy distribution conductors, to customer loads; primarily lighting and motors. The system operated at the same voltage level throughout; for example, 100 volt lamps at the customer's location would be connected to a generator supplying 110 volts. This 10 volt margin allowed for some voltage drop in the wires between the generator and load. The voltage level was chosen for convenience in lamp manufacturing. High-resistance carbon filament lamps could be constructed to withstand 100 volts and to provide lighting performance economically competitive with gas lighting. At the time it was felt that 100 volts was not likely to present a severe hazard of fatal electric shock. To save on the cost of copper conductors, a three-wire distribution system was used. The three wires were at +110 volts, 0 volts and −110 volts relative potential. 100-volt lamps could be operated between either the +110 or −110 volt legs of the system and the 0-volt "neutral" conductor, which carried only the unbalanced current between the + and − sources. The resulting three-wire system used less copper wire for a given amount of electric power transmitted while still maintaining (relatively) low voltages. Even with this innovation, the voltage drop due to the resistance of the system conductors was so high that generating plants had to be located within approximately a mile (1–2 km) of the load. Higher voltages could not so easily be used with the DC system because there was no efficient low-cost technology that would allow reduction of a high transmission voltage to a low utilization voltage. In the alternating current system, a transformer was used to reduce the voltage from the (relatively) high voltage distribution system to a lower and safer voltage for the customer loads. Lamps and small motors could still be operated at some convenient low voltage, but the transformer would allow power to be transmitted at much higher voltages of, say, ten times that of the loads. For a given quantity ofpower transmitted, the wire cross-sectional area would be inversely proportional to the voltage used. Alternatively, the allowable length of a circuit, for a given wire size and allowable voltage drop, would increase approximately as the square of the distribution voltage. This meant that fewer, larger generating plants could serve the load in a given area. Large loads, such as industrial motors or converters for electric railway power, could be served by the same distribution network that fed lighting, by using a transformer that reduced the voltage to a suitable secondary voltage. Edison's response to the limitations of direct current was to generate power close to where it was consumed (today calleddistributed generation) and to install large conductors to handle the growing demand for electricity, but this solution proved to be costly (especially for rural areas which could not afford to build a local station or to pay for the expensive, very thick copper wire), impractical (including inefficient voltage conversion) and unmanageable. Direct current could not easily be converted to higher or lower voltages. This meant that separate electrical lines had to be installed to supply power to appliances that used different voltages, for example, lighting and electric motors. This required more wires to lay and maintain, thus increasing distribution costs and compounding related safety issues. Any practical distribution system, capable of delivering commercially significant power, will use voltage levels sufficient for a dangerous amount of current to flow, whether it uses alternating or direct current. As precautions against electrocution are similar for both AC and DC, the technical and economic advantages of AC power transmission outweighed this theoretical risk, and it was eventually adopted as the standard worldwide. Tesla's US390721 patent for a "Dynamo Electric Machine"
The advantage of AC for distributing power over a distance is due to the ease of changing voltages using a transformer. Available power is the product of current × voltage at the load. For a given amount of power, a low voltage requires a higher current and a higher voltage requires a lower current. Since metal conducting wires have an almost fixed electrical resistance, some power will be wasted as heat in the wires. This power loss is given byJoule's laws and is proportional to the square of the current. Thus, if the overall transmitted power is the same, and given the constraints of practical conductor sizes, high-current, low-voltage transmissions will suffer a much greater power loss than low-current, high-voltage ones. This holds whether DC or AC is used. Converting DC power from one voltage to another requires a large spinning rotary converteror motor-generator set, which was difficult, expensive, inefficient, and required maintenance, whereas with AC the voltage can be changed with simple and efficient transformers that have no moving parts and require very little maintenance. This was the key to the success of the AC system. Modern transmission grids regularly use AC voltages up to 765,000 volts. Power electronic devices such as the mercury arc valve and thyristormade high-voltage direct current transmission practical by improving the reliability and efficiency of conversion between alternating and direct current, but such technology only became possible on an industrial scale starting in the 1960s. Alternating-current transmission lines have losses that do not occur with direct current. Due to the skin effect, a conductor will have a higher resistance to alternating current than to direct current; the effect is measurable and of practical significance for large conductors carrying thousands of amperes. The increased resistance due to the skin effect can be offset by changing the shape of conductors from a solid core to a braid of many small (isolated) wires. Total losses in systems using high-voltage transmission and transformers to reduce (or increase) the voltage are very much lower than DC transmission at working voltage. Edison carried out a campaign to discourage the use of alternating current, including spreading disinformation on fatal AC accidents, publicly killing animals, and lobbying against the use of AC in state legislatures. Edison directed his technicians, primarily Arthur Kennelly and Harold P. Brown, to preside over several AC-driven killings of animals, primarily stray cats and dogs but also unwanted cattle and horses. Acting on these directives, they were to demonstrate to the press that alternating current was more dangerous than Edison's system of direct current. He also tried to popularize the term for being electrocuted as being "Westinghoused". Years after DC had lost the "war of the currents," in 1903, his film crew made a movie of the electrocution with high voltage AC, supervised by Edison employees, of Topsy, a Coney Island circus elephant which had recently killed three men. Edison opposed capital punishment, but his desire to disparage the system of alternating current led to the invention of theelectric chair. Harold P. Brown, who was being secretly paid by Edison, built the first electric chair for the state of New Yorkto promote the idea that alternating current was deadlier than DC. When the chair was first used, on August 6, 1890, the technicians on hand misjudged the voltage needed to kill the condemned prisoner, William Kemmler. The first jolt of electricity was not enough to kill Kemmler, and only left him badly injured. The procedure had to be repeated and a reporter on hand described it as "an awful spectacle, far worse than hanging." George Westinghouse commented: "They would have done better using an axe. Be the first to comment !! !